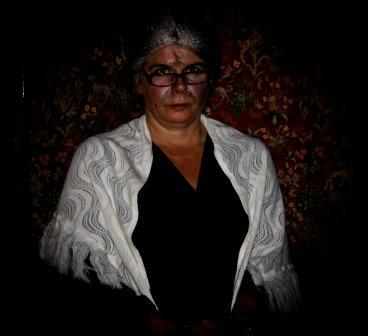 Swansea Hen Party Fright Night & Ghost Tour! Availability: We cannot accept Fright Night Bookings when there is a wedding on. Please see our wedding site availability 2019 and choose a date when there is no wedding. Fright Nights also cannot be run when there is a ghost hunt; choose a date that is wholly clear. ABC: Alcohol. Behaviour & Conduct: Fright Night participants can become merry. Provided you can 'hold your drink' this is not a problem. It is a fun occasion after all. However you must, upon entry into the upper derelict levels, be sufficiently 'alert' to follow the Ghost Tour Leader's instructions, for your own safety and that of others in your group. This will be up to the judgement of the Ghost Tour Leader. We have many regulars at the castle who visit Craig y Nos for a peaceful break and tranquil walks in the Brecon Beacons. Please respect other B&B residents, castle guests and dog owners. Here is what I recommend we do. The whole tour is done by candlelight, the darker and spookier the better! You and your friends will huddle together for warmth and reassurance, all around the low glow of a single flickering yellow candle. Behind your huddled backs, surrounded by the blackness of the unlit, cold derelict levels of this old haunted castle, you will sense the emptiness of the darkened space all around. But you can't help wondering, as you hear footsteps and sounds, creaks and flutters around you, how 'empty' is the room, really? As your sensations are heightened, you'll find collectively as a group, a genuine psychic tension, a heightening of your sixth sense. Together the fear will come upon you. You'll begin to wonder.... what lurks behind you in the unseen depths of darkness all around? Two Course Dinner Party (choose food from the menu up to a value of £25/ head) sat at your own private party table. 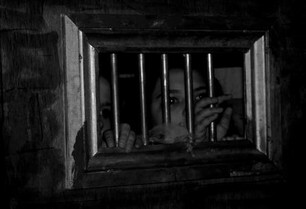 Two Hour Ghost Tour based on our Share the Experience Tour but a lighter more relaxed version. 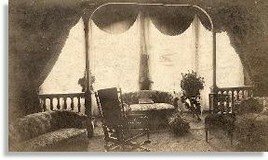 Real Ghost Stories about this Haunted House, regaled from within the 'The Cross Room' Haunted Bar* in the Derelict Area. Here warm spirits may be served in the company of and along with tales of spirits, as you huddle together for warmth around the red glow of old logs burning in the Cross Room's old wood burner. Also included is use of sports room and hot tub *Note that ghostly make-up and body tans etc cannot be used in the hot tub as it comes off in the water. Best to use hot tub either before you get ready for the night, OR the next morning, after a shower. 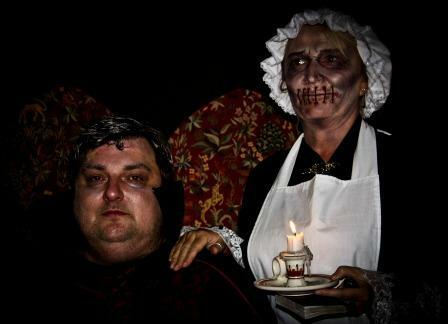 The balance of £40 per head is paid by guests on arrival, split £25 to the Castle for the 2 course evening meal in our restaurant/ bar and £15 per head to the ghost tour company on the night of the tour. *If the ground floor bars and function rooms are booked by other events, you and your fellow hens will flock to 'The Cross Room', our well stocked Haunted Bar deep within the derelict Upper Levels of the Castle. 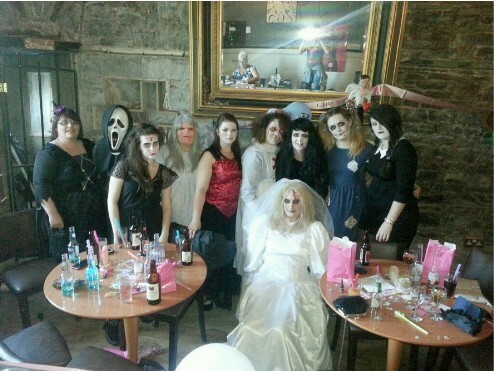 Your Swansea hen party group will have exclusive use of the Haunted Bar for your Party. Given the history of this haunted castle and its reputation for ghostly activity, this will be a night you'll never forget. We shall make it as truly memorable as the wedding day itself - maybe more so. 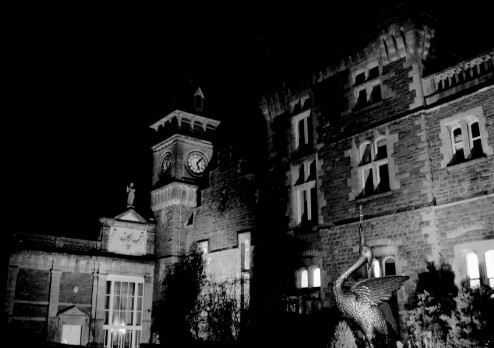 Steve Graham of the 'The Paranormal World' is your Host for this extraordinary Swansea Hen Parties Ladies' Fright Night in the derelict upper floors of Wales' Most Haunted Castle. 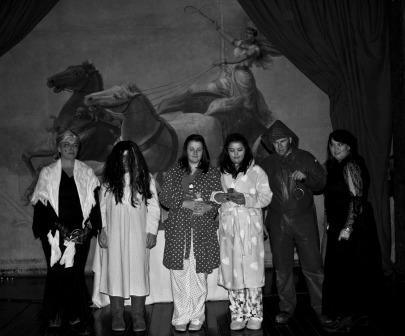 This is a haunted house hen party tour you will never experience anywhere else! It is a light hearted fun filled ghost tour and does not include proper séances, table tipping, energy circles etc. This is the ultimate Swansea Hen Party - if you dare! But don't run. Never run. Hold hands around the table, stay together, never break the circle. I may appear as a walking corpse. You'll know it's me. Your fellow hens may not! With my face painted like death warmed up, I lead you from room to room. On the way, I'll relay scary tales, true ghost stories, tales and experiences from previous happenings on professional investigations in this most haunted castle. Unbeknownst to you, my assistants (maybe of this world, maybe of the next) will be cunningly concealed as ghosts in cupboards, coffins and under beds in our haunted rooms, ready to make a heart stopping appearance when least expected. (This Swansea Hen Party may not be suitable for anyone given to palpitations, irregular heart beat, heart problems, sudden fainting, swooning etc). Curtains will twitch, objects may move, boards will creak, doors open and close, all without explanation. For the finale we sit in a séance around a table. It is here I give some of your party pertinent information only they know, coming from beyond the grave. How we do the seance rather depends on the organiser (bride or a friend arranging the evening on their behalf). For real impact, don't tell your friend a thing! Just give me a few details to work with a couple of weeks prior to the event, for maximum effect. These little nuggets I cannot possibly know, yet they are revealed to me, as if 'from the other side'. Look on in wonderment, as secrets are revealed in the cold black night, our faces flickering by the light of a single dripping candle. Our grand finale seance with maybe a little help from you - but that'll be our little secret! The Hen party tour lasts about 2 hours and is always a great success... But I do not stop there. 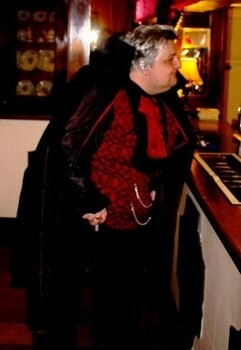 The whole Ladies Fright Night has to be kept fun filled. After the tour we'll repair to the Haunted Bar in the derelict 'Cross Room', on the haunted first floor of this old Castle. We'll rest awhile by the glow of a wood burning stove, but do not get too comfortable, for a few more surprises may await you yet. 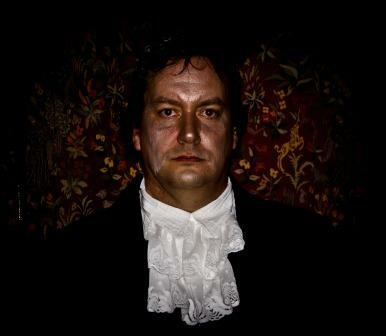 I'll be your ghostly barman, regaling you, if you have not yet had your fill of the Spirit World, with further spooky tales from the Haunted Castle, tales from other ghost hunts before yours, and from 'the beyond'. We keep you filled with spirits behind the bar, of course, but you and your party will delight too in the many spiritual tales and ghost stories - your spine tingling long into the night. Have a drink, but do not leave the Haunted Bar alone. Do not walk the first floor passages alone. The corridors are dark at night, and who knows what you'll meet? That's the key to our Swansea hen parties being so memorable - a chat around the fire in our Haunted Bar in 'The Cross Room', a few spirits to warm you, and the Spirits all around to keep us company. AT THE END OF YOUR FRIGHT NIGHT: When you're ready to retire, maybe around dawn, or earlier if you prefer, I'll guide you back to the safety of the Nurses Block Lounge, by which time you'll all be well fuelled with spirits from the Haunted Bar and ready for a late breakfast the following morning. As I disappear into the night, you'll review the night's experiences together, until you are ready to 'give up the ghost' and sleep (if you can). "Was at the castle for a hen do and we all had a blast. I hated the thought of ghosts but when you're at the castle it feels good and safe. Loved the tour and the staff were class. I will definitely be back in the future. Thanks very much for all the information over Twitter/email. Great service, awesome castle, class actors. Thanks again." The next day, rise late to a Hearty full cooked breakfast and then go on our Castle History Tour (starts typically 10.30 am). If you have your wedding booked at the Castle, you may wish to incorporate the Ladies Fright Night into a wedding package deal. Have your hen night at the castle as well as your wedding. If you have not chosen the castle as your wedding venue, here you can try somewhere completely separate and 'different' for your Hen Night. 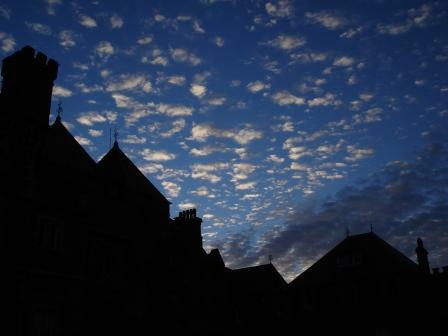 For an Evening of Frights you'll remember the rest of your life, 'Enquire Now'. To give you a better understanding of how the Fright Nights work... you and your guests check-in at reception, whereupon you are shown to your rooms in the "Nurses Block". You have your own communal lounge in the Nurses Block. Pop up to Bar to buy a couple of bottles of wine or bubbly and get in the spa (ask for plastic glasses for the Spa area). Pamper yourselves and relax. Around 7pm it's time to sit down for your 2 course dinner. After you have dined, you'll retire to the bar where I will join you and be your guide on a Fright Night you will never forget... You will be offered refreshments along your journey within the derelict areas (normally vodka based)... After the 2 hour tour it's back to the Haunted Bar for some more fun and games and ghost story telling. I will be your barman for the rest of the evening and the Haunted Bar is for your group exclusively, as long as you want to stay up and party. This is just the basics of your evening. Every tour is different, individually tailored around you and your guests. Just let me know what date or dates you have in mind and we will go from there. Attention Hens! If you are thinking of getting in a male stripper, please let Steve of the Paranormal World recommend one for you. One of our clients was unfortunate with the agency they chose - see our Blog on 'Strippers - Rip-Off or Strip-Off'. Instead let Steve give you a few recommendations that you can call (you'll still need to book the stripper direct yourself of course). Steve assures me he knows plenty of reputable stripper agencies!